And held us as his captive. The Murd’rer cannot harm us. Tr. Richard Massie, 1854, alt. Weser Renaissance performs an arrangement by Andreas Hammerschmidt on the album Andreas Hammerschmidt: Sacred Works , track 6 (iTunes• AmazonMP3). Con Anima performs an arrangement by Michael Praetorius on the album Gelobet seist du , track 23 (iTunes • AmazonMP3). Schola Stralsundensis performs an arrangement by Antonio Scandello, an Italian musician who served for some time in Dresden and made valuable contributions to the Lutheran chorale tradition, on the album Petitiones Cordis , track 7 (iTunes • AmazonMP3). Ensemble Sagittarius performs an arrangement by Johann Hermann Schein, from his Opella Nova , on the album J.H. Schein: Opella Nova & Fontana d’Israel , track 15 (iTunes • AmazonMP3). 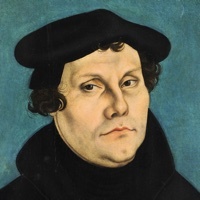 Luther’s hymn “Christ Jesus Lay in Death’s Strong Bands (Christ lag in Todesbanden)” is his reworking and expansion of the earlier “Christ Is Arisen (Christ ist erstanden),” which was one of his favorite hymns. It first appeared in the Erfurt Enchiridion of 1524. From there it worked its way into virtually all subsequent Lutheran hymnals. 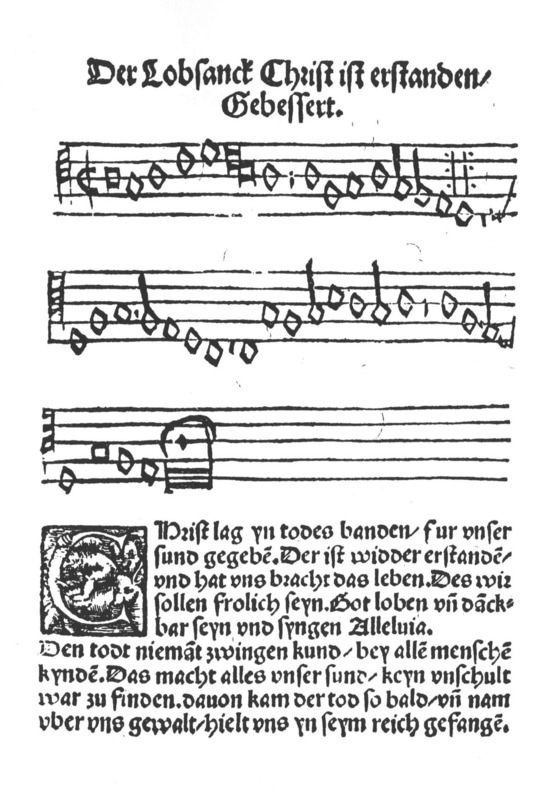 The first page of “Christ lag in Todesbanden” as it originally appeared in the Erfurt Enchiridion, 1524. Luther’s original follows a rather more complex metrical form than the English version would suggest. The English is a straightforward 8.7. 8.7. 7.8. 7.4., whereas Luther’s German has seven syllables in each line leading up to the final Alleluia. That means that a slur is included in the first line of the A section that is not present in the English version, and for the meter to be maintained, the slur must move to a different syllable from stanza to stanza. The translation, which is in the public domain, is that by Richard Massie, 1854, as altered for the Lutheran Service Book , 2006, No. 458, though some phrases have been restored from the Evangelical Lutheran Hymn-Book , 1927, No. 224, as better reflecting the German original.